Sorry I have been busy with my Fashion Blog lately, haven't had time to update my cooking blog this month. 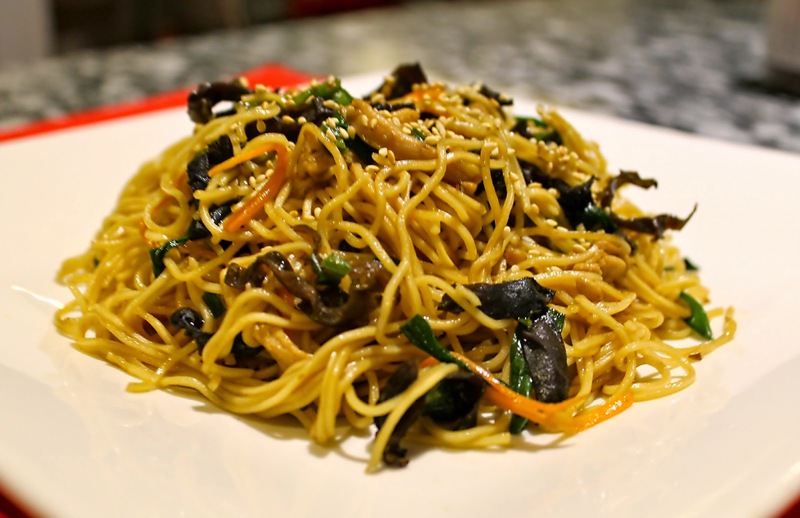 But, I have been cooking :) Since my older daughter started going to kindergarten this year, so I have been making a lot of "lunch friendly" meals and this fried noodle dish is one of my favourites. My daughter loves wood ear mushrooms because they have an unique texture and very chewy. It's like the good combination of mushroom and jelly in a very thin version. I like to use wood ear mushroom in my cooking just simply because it's very healthy and easy to cook. You can add it to almost every dish. See wood ear mushroom recipes Here and Here. Soak the wood ear mushroom for 15 minutes before cooking. Wash and clean the wood ear mushroom after soaking, pad dry and julienne them. Cooking sauce: In a small bow, add 2 tbsp soy sauce, 1 tbsp vinegar, 1 tsp cooking wine, 1 tsp sugar, 1 tsp white pepper powder and a little bit salt. Then mix evenly. In a large pot, add water and bring to a boil. When the water is boiled, add the noodles to cook. Just cook the noodle for a minute or two, drain the water. In a non-stick wok, add 2 tbsp cooking oil over medium-high heat. Add the chopped green onion and ginger slices to cook. About 2minutes, add the chives, julienned wood ear mushrooms and carrots to cook. Stir fry everything for about 2 minutes, when the chives turn dark (that means they are tender), add the shredded chicken. Fry everything for about 4-5 minutes, until the chicken is 70% ready, add the noodles to fry. You can add 1 cup of chicken broth. And then add the cooking sauce that you prepared earlier, stir everything evenly. Cooking everything for about 3 minutes, add 1 tbsp sesame oil, mix evenly. Transfer everything to serving plates and garnish with roasted sesame seeds. Enjoy!